The British Government had always been infuriated and distraught by the high moral values of Biafrans, since their encounter with the Biafrans many centuries ago. For this, the British, as represented by their government, had/has made it a policy strategy to emasculate Biafra so that peradventure, Biafra could be driven into insignificance, irrelevance, and into oblivion. This was the main strategy thought behind the criminal amalgamation that gave birth to the present evil forest, multi headed monster, and fraudulently concocted contraption called Nigeria. Since the concoction of the evil edifice called Nigeria the parasitic and exploitative government of Britain has been working with their Fulani stooges both in Nigerian military uniform and the ones without uniform in launching all kind of missiles against the good people of Biafra with the apogee being the unwarranted, yet, unmitigated GENOCIDE. They have killed through terrorism, physical torture and shootings, which has claimed the lives of over 10 million persons (1945 till date). The most recent acts of open genocide against Biafrans were Python Dance and Crocodile smile 1, 2, 3 etc aimed at the so called South East and South-South, which constitute the greater parts of Biafra land, (bearing in mind that parts of Benue and Kogi are still included in Biafra). Britain, through their Fulani proxy, has made killing Biafrans a habitual routine, while the so-called UN has made folding her hands, closing her mouth, and looking away, a norm. The crimes of Britain against Biafrans, and the complicity of the so-called international bodies can be seen in the way they have reacted/responded in the atrocious criminalities of Britain. They have destroyed our entire physical and spiritual environment. They have closed and labelled as criminal our cottage companies and commerce. Even media licence is so difficult for us to get and retain in the zoo called Nigeria. Freedom of information Bill signed into Law by GEJ does not exist in the copy of the constitution they read. Truly they only read and practice Sharia Law. Equally, they have refused to license and finance Biafrans to explore exploit process and refine the natural resources in Biafra, including petroleum oil. We Biafrans are completely alienated from the affairs of Nigeria by British proxy government of Hausa/Fulani/Yoruba stooges. We Biafrans cannot even be allowed to choose our leaders and if we dare, such are killed or chased as criminals. We are treated like slaves in our land. We Biafrans are completely excluded from participating in the oil industry, despite the fact that we wholly bear the brunt of the environmental devastation resulting from oil exploitative activities. When one puts all these acts of exclusion into perspective and objective consideration, one can see why the restoration of our dear nation, Biafra, remains sacrosanct. We are asking for a referendum so that we peacefully exit Nigeria, since we bear no ills in mind against other Nigerians, to let them quietly stay on their own. We are not calling for war. This place called Nigeria will develop faster if everybody will quietly go and have his freedom. Biafra, Oduduwa and Arewa will compete for development and the world will be better for it. 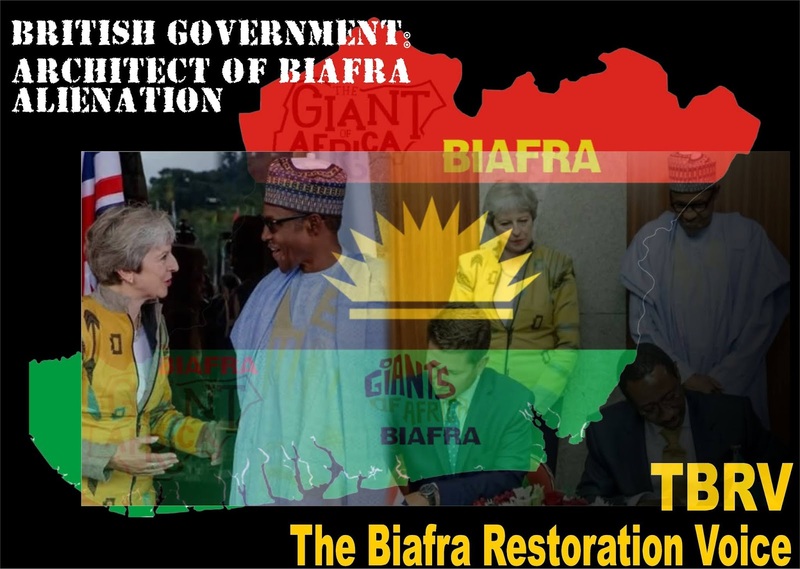 But because of British greed, jealousy, covetousness, hatred, and fear of Biafra, all these incompatible nations must be lumped together so as to create the chaotic environment that will always enable the parasitic Britain to cart away the wealth of Biafra (OIL AND GAS) unquestioned, unhindered, and unaccounted for. Britain, in order to whittle, stifle, and stagnate the development of Biafra and Biafrans, has always put the far away Sahara Desert dwellers, the Fulani, in charge of the contraption Nigeria, and by Implication, the oil industry so that they can always take orders from the parasitic and predatory Britain. No wonder Britain can go as far as hiring the terrorists in army uniform to wipe out whole Biafra communities for the expansion of their oil exploitation activities. The contemporary heinous criminality issue, which remains unprecedented in the history of modern Africa, is the act of desperation and forgery by Britain, which blindly pushed Britain to manufacturing a replacement for the late Muhammadu Buhari, from Jubril Aminu of Sudan, and forcefully foisting same on Nigeria, in a dastardly impunitious manner. This act of criminality and inhumanity by Britain is in a bid to ensure that Biafrans are consistently held in perpetual subjugation and endless enslavement. Biafrans must not lose sight of our imminent referendum, which no Biafran can afford to handle with levity, as nothing short of overwhelming success of the referendum will be acceptable to Biafrans.